Fibromyalgia is a disorder characterized by widespread musculoskeletal pain, described as a constant dull ache, typically arising from muscles. It effects 2% of general population and women are much more likely to develop it than are men by a ratio of 9:1. It is a devastating and often unpredictable condition that causes dreadful pain and impacts life by interfering with the ability to do the simplest things. While fibromyalgia is not well understood, current thinking is that it is the result of central augmentation of pain sensitivity, either triggered by a traumatic event or developing gradually. In addition, it has been suggested that sufferers of fibromyalgia have a magnesium deficiency caused by stress and lack of restful sleep that subsequently triggers nerves to respond to even minor stimuli (London, 2007). The Fibromyalgia Flotation Project selected Fibromyalgia for study because the characteristics and symptoms of this disorder correspond closely with conditions that were reported to benefit in prior floatation REST studies. The Fibromyalgia Flotation Project (FFP) has been created to document the efficacy of flotation REST as a treatment for people suffering from fibromyalgia. The International Flotation Research Group, an informal group of scientists and entrepreneurs interested in Flotation REST (Restricted Environmental Stimulation), organized this research endeavor. FFP is a voluntary, international effort. No remuneration or profit is received by any of the organizers. The first study completed by the FFP was presented at the Float Summit 2012 in Gothenburg Sweden. The results of that study provided compelling evidence that flotation REST can greatly improve the lives of people with fibromyalgia by significantly decreasing their pain, muscle tension, anxiety and stress. It also significantly increased freedom of movement, energy, mood and quality of sleep. Most of these improvements showed longer-term relief as the participants floated repeatedly. 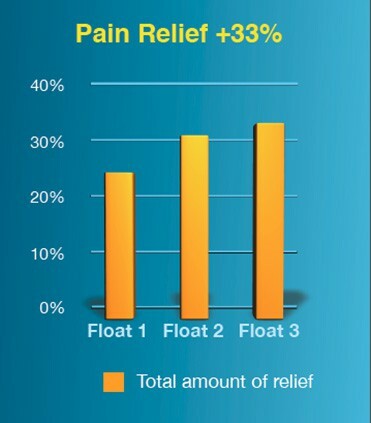 This initial study had participants float once a week for three weeks but case studies suggested that extended use of flotation REST can reduce fibromyalgia symptoms to near zero. It was decided to explore the longer-term possibilities by creating a longer study. Linked to stress as a trigger and as a causal factor. Inability to achieve restful sleep. For this study the Fibromyalgia Flotation Project is utilizing a novel approach to collecting clinical data by using this website to recruit participants and float centers, and to gather data for analysis. Fibromyalgia is a syndrome characterized by chronic pain and soreness in muscles, tendons and other connective tissue. It affects millions of people worldwide, and it is treatable but not known to be curable. Initial results from a recent international research study demonstrate that Floatation REST therapy can help sufferers of Fibromyalgia relax, manage pain and attend to tasks which normally cause them difficulty. Twenty-three volunteers completed a total of three one-hour floatation sessions, which were held five to seven days apart. Almost all of the volunteers were women aged 30 to 62. The patients were asked to self report on a number of measures related to emotional and physical well-being. Directly before and after each session, patients used a ten point scale to indicate their levels of stress, pain, muscle tension, movement, energy, well-being, relaxation, sadness and anxiety. On average there were significant changes in all patient-reported levels, and in the direction expected, though the magnitude of these changes varied. Across floatation sessions, decreases in muscle tension and pain were evident. For both variables, patients indicated a 25% reduction in the first session and a 33% reduction in the third session. Pain relief lasted an average of 2.5 days, and in the small sample (n=8) of patients who completed all trials and provided duration scores, the average progression was 1.9 days, 2.5 days and 3.2 days in order of floats. 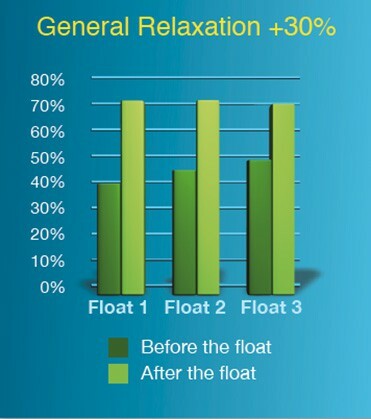 Statistical analysis revealed that during all floats the patientʼs level of relaxation increased 30% on average and levels of stress decreased 30%.